ROAD TOWN, Tortola, VI– Construction work to improve the road network on Jost Van Dyke began on October 4, 2012 as part of the Government of the Virgin Islands’ and Caribbean Development Bank’s (CBD) Infrastructure Rehabilitation Loan Project. According to Project Coordinator, Dr. Drexel Glasgow, the project, which is the first of many, will be completed under the terms of the CDB Infrastructure Rehabilitation Loan. 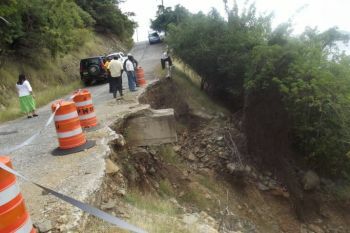 He told the Department of Information and Public Relations that the scope of work will include the restoration to severely damaged roadways and the installation of culverts and wall structures to accommodate proper drainage in the area. Construction works will be concentrated on East Road, which sustained severe damage as a result of continuous flooding, landslides and hurricanes. In January, Minister for Communications and Works Honourable Mark Vanterpool and his team traveled to Jost Van Dyke to assess the affected areas. Minister Vanterpool continues to pledge his commitment to tackling the most vulnerable areas first as part of the Rehabilitation Project, so that residents most affected will get immediate relief. Construction works will be ongoing for a period of three months. During this time, the Ministry of Communications and Works is asking motorists to exercise extreme caution while driving through the work zone. The road through the construction site will be reduced to one lane of traffic for the duration of the construction. Motorists are asked to adhere to temporary signs and other traffic control measures in the work zone. The Infrastructure Rehabilitation Loan Project is a joint venture between the Government of the Virgin Islands and the Caribbean Development Bank to improve the Territory’s infrastructure that was damaged as a result of the impact of sub tropical storm Otto in 2010.
watch that coordinator Mark, he tends to act the fool and get a big head when power gets to his head.